A fully soluble fertiliser containing nitrogen, phosphorus, potassium, sulphur, magnesium and trace elements recommended for vegetables, fruits, flowers, turf, vines and ornamentals grown in soil and soilless culture. Campbells Diamond Blue is a fully water soluble, chloride free fertiliser containing the required nutrients for consistent growth and development of a range of plants providing immediately available nitrogen, potassium, phosphorus, sulphur, magnesium and trace elements. Diamond Blue is a soluble fertiliser alternative to dry spread complete fertilisers and can become the basis for a complete fertiliser program. The specific formulation of Diamond Blue is ideal for plants during their early growth stages, where development of new shoots and leaves is the main goal or for crops that require additional nitrogen. The addition of trace elements helps to maintain balanced nutrition and is present mainly in the chelated form for maximum efficiency and uptake. 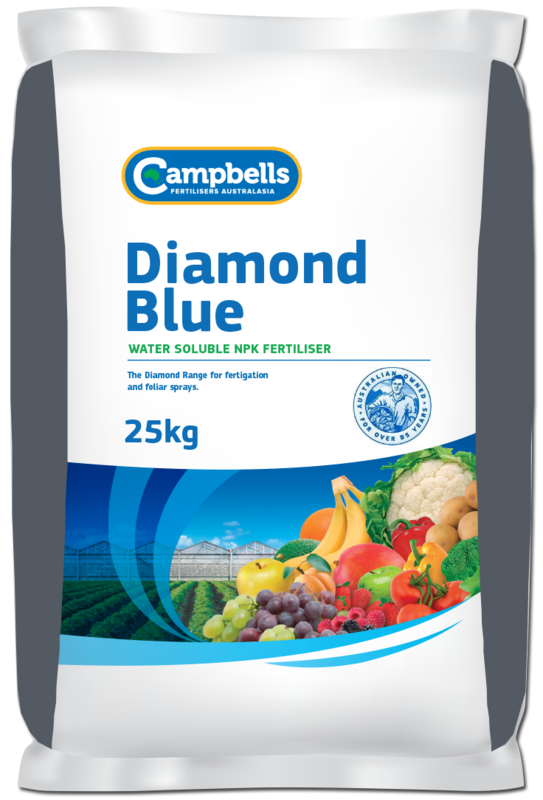 Campbells Diamond Blue is suitable for application via irrigation systems (fertigation) in soil grown crops and for foliar application. It dissolves rapidly and completely and remains in solution ready for root adsorption or is taken in via leaf surfaces. – Situations where fertigated or foliar complete fertilisers are the preferred option. General fertigation rates for horticultural crops are between 25-70 kg/ha in field crops and approximately 1g/L in a hydroponic situation. When applying Diamond Blue through the irrigation system more frequently and smaller applications guarantee the nutrients are supplied to the plants without being lost due to leaching or excessive rainfall. Foliar applications at a concentration of 0.25-0.5%. A more complete nutrient program would include both Campbells Diamond Blue and Campbells Nitro-Cal, applied during alternate fertigations. As with any fertiliser program, it is best to seek advice from your Campbells Diamond Blue distributor or your local agronomist.